1. 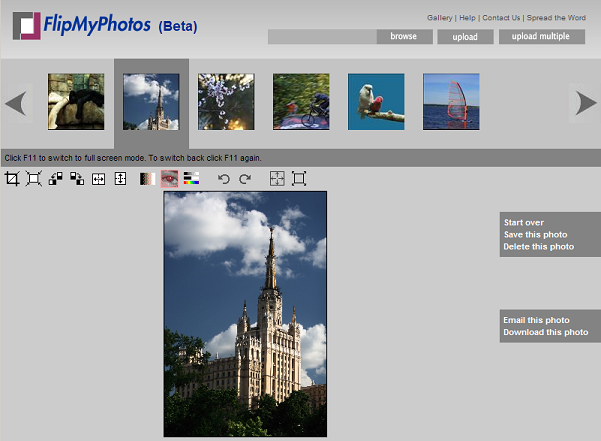 To get started you need to upload a photo to image editor. You can use the simple upload method or the multiple upload tool. 2. After an image is uploaded you will be able to edit it. You can crop, rotate, adjust the brightness, etc. The easiest way to crop an image is to select an area to crop with the mouse and then double click inside selected area. Here you can find a full description for every function. 3. After you're finished editing an image you can simply download the image to your computer or email it. Currently, images are stored only for 24 hours, so make sure to save them after you done editing. 4. To chose another image you can upload it or if it's already uploaded you can select it in the image strip.